You are here: Home > What are the Sacraments? We believe that a sacrament is something commanded by Jesus Himself; that has a visible, earthly element, and imparts the forgiveness of sins to those who receive it. With this view of the sacraments, we teach that there are two sacraments: Baptism and Communion. Baptism is the application of water in the name of God the Father, Son, and Holy Spirit in response to the command and promises of Jesus (Matthew 28:19, 20). In Baptism, we believe God embraces and adopts us as members of His family. Since we see Baptism as God’s act and not ours, we baptize people of all ages, as all are in need of this gracious gift of God. 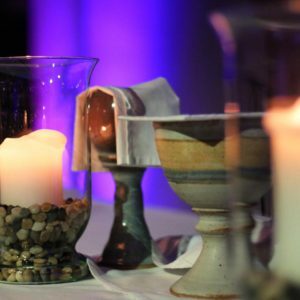 Communion (or the Lord’s Supper) is more than just an ordinary meal. It is shared with baptized Christians as a way of connecting with God and with one another. We believe that through the Lord’s Supper, God comes to love us and forgive us. It is a meal of renewal in which Jesus is really present. In the Lord’s Supper, God is acting in and through Jesus Christ to extend forgiveness for sins and to empower His people to live fully for Him.